I have quite narrow tastes in music. I love classical music, a bit of musical theatre and nothing much else! On special occasions, like our wedding anniversary, my husband and I will go to a Symphony Orchestra Concert, which for me is a fantastic way to celebrate. It always amazes me how so many different instruments can all play together to make such a beautiful sound. On reflection, I think our life is a Symphony. There are so many bits and pieces, joys and sorrows, friends and family that make up one's life. How we bring it all together can make a beautiful symphony or a terrible cacophony! The best way I know of expressing this thought is to make a quilt! Meet my Symphony of Life quilt! I commissioned my 12 year old grandson to draw the instruments for me, seeing I am a woeful artist and he is exceptionally good, then I added what he calls my "abstract flowery things". I think he did a fantastic job with the drawings. 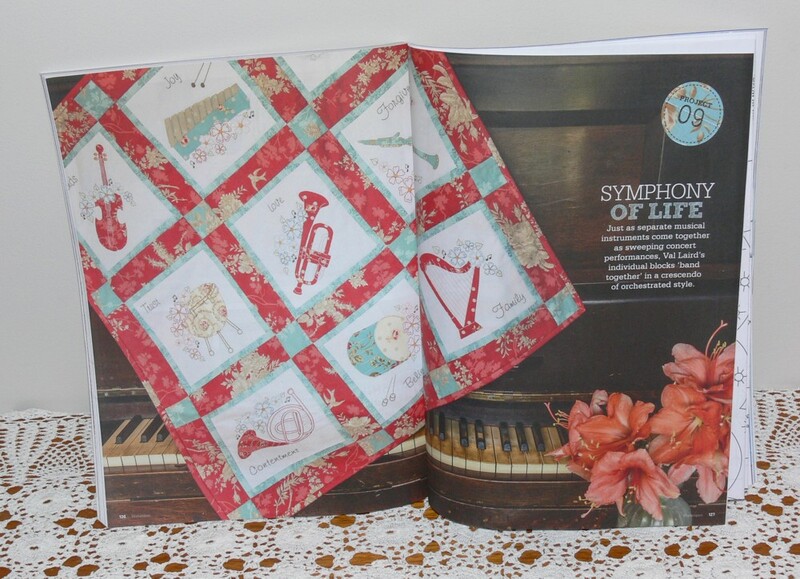 I just loved turning them into applique and stitching all the details and the words that make up the Symphony. 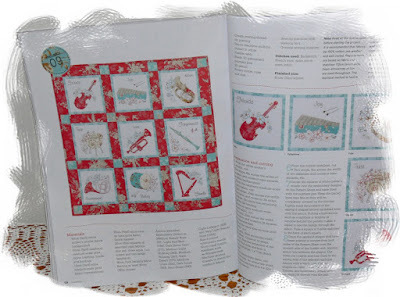 Homespun Magazine liked it enough to publish it! It's in their latest edition, November Collector's edition. It's one of my designs that just makes me smile every time I look at it - definitely my favourite this year! Now I need to work on making my own life a beautiful symphony! It looks lovely, Val. Your grandson certainly is a great artists. Maravilhoso trabalho! Amo a música clássica, pois ela acalma meu coração. Ainda estou atrasada com o outro trabalho, pois estamos em vias de mudança de Estado do Paraná para o Estado do Espírito Santo onde estão meus filhos e netos. Com certeza um dia terminarei. 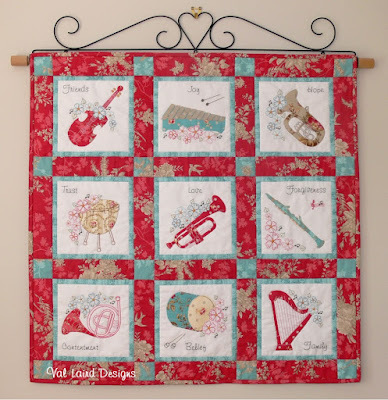 HI Val--what a pretty and delightful musical quilt--and how wonderful that you took a childs drawings to make it--he must feel really proud--I am unable to get that magazine but am interested in the pattern--will you have the pattern for sale at some point?? IT's beautiful Val! How nice to have your own personal artist to help with the drawings. Val, it's so beautiful! I must figure out a way to get this issue. I loved each of the blocks you showed, and I loved the sentiment that is given voice in the quilt. Thank you for sharing the pictures. He is quite a good artist, and so are you. What a lovely concept! You are so creative, and it looks like your grandson has inherited some of those genes, or he is a keen orchestral fan! 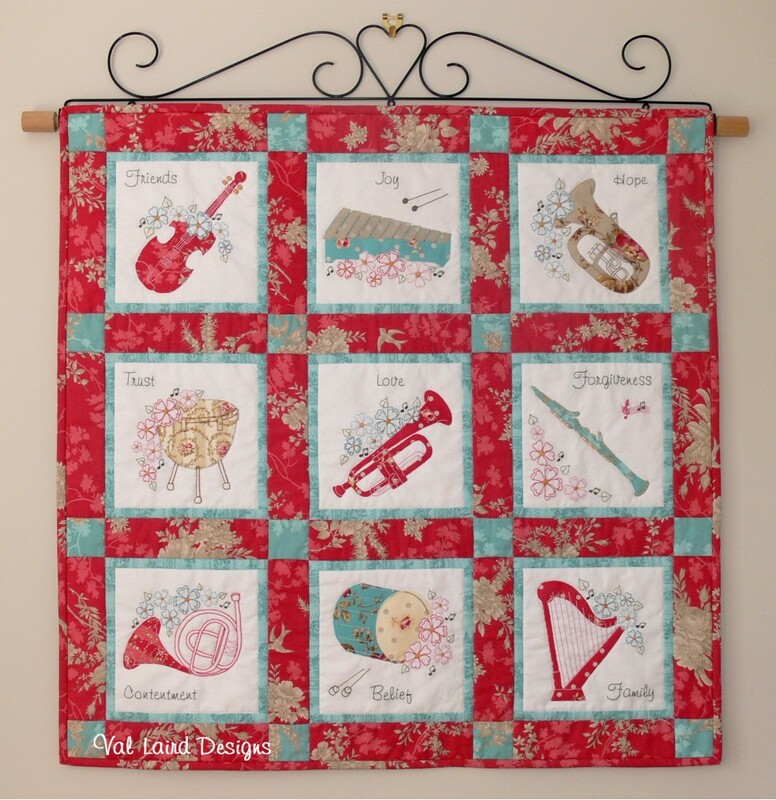 The quilt makes me think of Andre Rieu, one of my favourite entertainers. How clever is your grandson! Looks wonderful. What a great team you two make!! Love the quilt. Looks just gorgeous! You must be SO proud of your grandson! Wish I could get the magazine with this quilt - here in the USA it is so hard to find! Love all your designs and thank you for all the free patterns. I know I'm not alone in letting you know how much you are appreciated! Congratulations on being published (again!). It is a beautiful quilt and a great reminder of what is important in life. It is so beautiful! So, I want make it. can you tell me which magazine I have to buy in a detail? ?